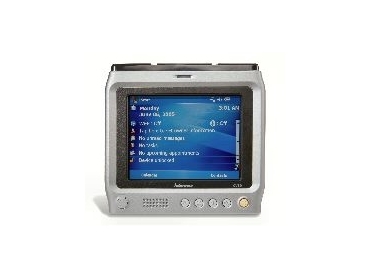 INTERMEC has introduced the CV30 fixed-mount computer with a choice of Windows CE.NET 5.0 or Windows Mobile 5.0 operating systems, multiple mounting options, Cisco Compatible WiFi, Bluetooth and RFID support. The CV30 is more than 50 percent smaller than most vehicle-mounted devices, and complies with new OSHA standards to provide maximum unobstructed visibility for forklift operators without compromising durability. It features a sharp, 16.5cm full-screen colour display and easy-to-use keyboard that supports most applications. The touch-sensitive display is heated, making it ideal for cold warehouse operations. The CV30 is the first fixed-mount computer to let customers choose between Windows Mobile 5.0 and Windows CE .NET 5.0 operating systems. It also includes Intermec’s factory-loaded TE2000 terminal emulation, enabling immediate integration into any enterprise without modifying key legacy applications or retraining users. The CV30’s integrated 802.11b/g WLAN radio is Cisco Compatible Extensions (CCX) certified for simplified application development and seamless interoperability in Cisco infrastructures. The integrated Bluetooth radio supports wireless barcode scanning while eliminating annoying and potentially dangerous cables. Paired with a Bluetooth wireless headset, it enables support for wireless speech recognition for voice-command picking operations and VoIP. The CV30 has two styles of vehicle mounting, as well as a desktop mount for work-in-progress and other stationary applications and a wall-mount option for time and attendance applications.